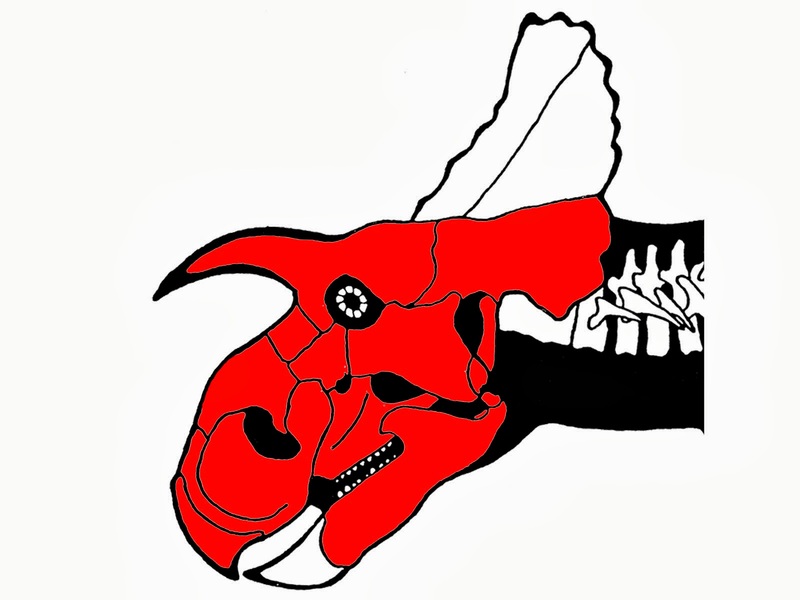 If you've been following the progress of our Avaceratops (or something like it) project, you may have noticed a lull in updates, especially after the completion of the reconstruction of the skull about a year ago. This is about to change. This summer we finished preparation of all the material we recovered from the site, all 170 or so numbered bones plus a good amount of unnumbered things that were discovered deep within the larger jackets during lab work. We had no idea how complete this animal actually was. For the better part of a year the bones were in drawers and on shelves in no particular order, so it never really seemed that impressive. Once we laid it out however, we were shocked. This thing really does look like an animal! It takes up quite a bit of space in the "run over by a bus" pose right now, but when assembled, the specimen will be on the order of 13 feet (4m) long, and approximately 4 feet (1.2m) tall at the hips. A cute little juvenile! All of the missing bones will either be sculpted from scratch (last option) scanned from the opposite side and printed in mirror image, or be scanned from other ceratopsian specimens and be manipulated in the computer to fit before printing.